The Norwich Singers are a friendly group of people, and we welcome tuneful and enthusiastic new singers of all ages. Our programmes cover light music, madrigals, sacred music and major choral works. We rehearse each Wednesday evening from 7.30 to 9.30 pm at the Methodist Church on Rosebery Road in Norwich, and music is provided. We are particularly keen to recruit new bass members of the choir. If this is of interest to you, or you know of a gentleman who might be interested in singing with us, please contact our Musical Director Jason Lambert or Chairperson Suzanne Long – contact details for both Jason and Suzanne can be found here. 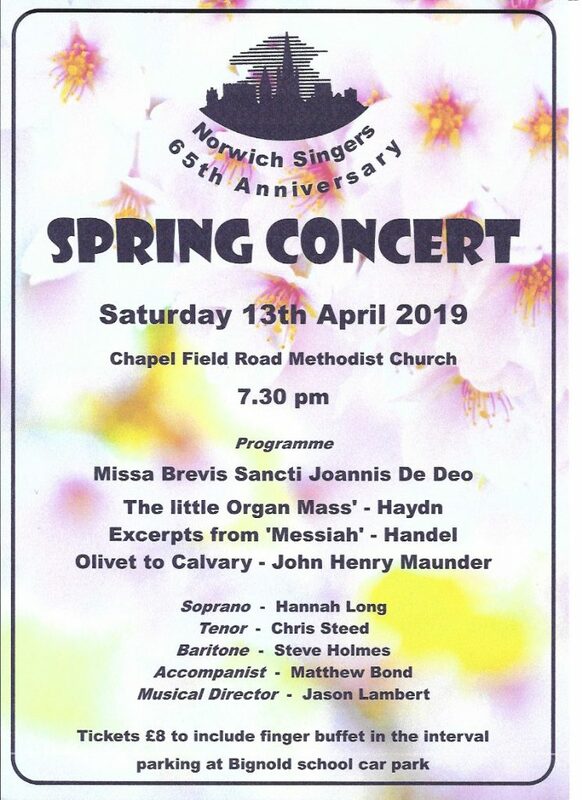 The Norwich Singers will be presenting a varied selection of Classical choral music at their Spring Concert. Together with professional soloists, Hannah Long, Chris Steed and Steve Holmes, the choir will perform pieces by Haydn, Handel and John Henry Maunder.